When people hear the terms “work from home” or “telecommute,” they often imagine sleeping in, wearing pajamas all day, and lounging on the couch with a laptop while the TV drones in the background. Those of us who operate businesses from our homes know that the reality is actually quite the opposite. People who are required to work in formal office settings tend to take for granted all the work that is done for them in regard to maintenance of the space, cleaning, and even security. When your office is located inside your home, it’s up to you to keep it safe and secure; it is your livelihood, after all. With the help of the Internet of Things, you can use home automation to safeguard your home office with a simple swipe on your smartphone or tablet. 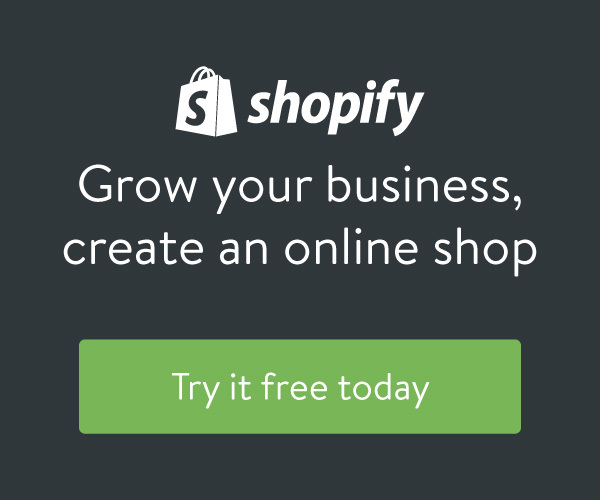 Even if you’re running a business that has no inventory to protect, chances are you still have important paperwork that could mean serious trouble if it were to fall into the wrong hands. Think financial documents, licenses and certificates that could put make you susceptible to identity theft. And, of course, there’s also your computer and other electronics that need protection. This is where a smart alarm system can come into play. Today’s alarm systems, like the tattletale Wireless Portable Alarm System Security Device Kit, offer full dispatch monitoring with text and email notifications, pet modes to allow pets to roam freely without tripping the alarm, and remote arming and disarming via a portable personal device. 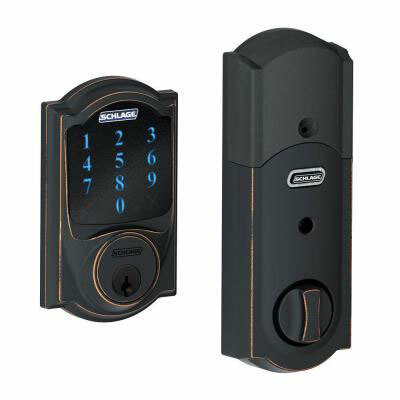 The Schlage Camelot Aged Bronze Touchscreen Deadbolt with Alarm provides the highest level of residential security. In addition to the locks located on your home’s exterior doors, it may be wise to install a smart lock on your office door, as well. By doing this, you can keep out curious pets, children, cleaning staff, babysitters, and any other houseguests. Smart deadbolts like the Schlage Touchscreen Deadbolt with Alarm require no keys, can be locked and unlocked remotely, can be programmed to give different people access with their own codes – for example, a business partner who might need access to your office – and finally, can send push notifications when the lock is disengaged. It’s never a bad idea to set up sensors around your home office. This way, you’ll be able to monitor temperature, motion, light and humidity remotely from your smartphone. If your business involves edible merchandise like cupcakes, or even wine, sensors are important for keeping your goods… well, good. You can get push notifications for anything you’re monitoring as well as connect your other home automation devices through systems like Wink. 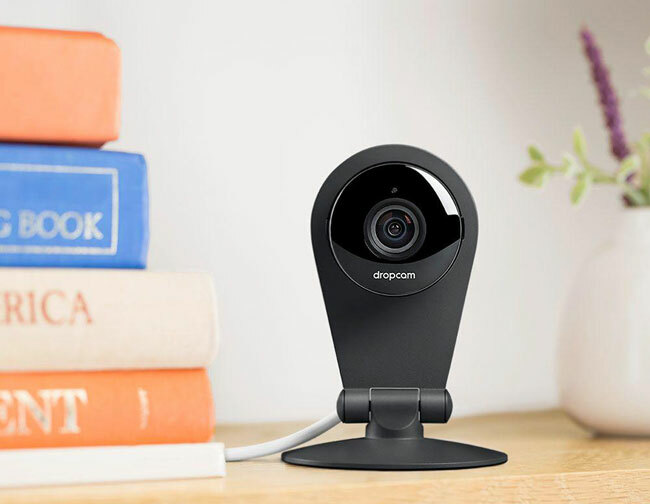 These might seem like a no-brainer, but premium, high-definition, cloud-based video like that supplied by Dropcam Pro Wireless devices can provide the ultimate in security by allowing you to monitor your workspace 24/7 via a live feed from your smartphone, tablet or computer. You can also record and take advantage of the night vision features, as well as receive alerts the moment your cameras detect motion in your space. The Dropcam Pro Wireless 720p Indoor Wi-Fi Security Camera is available in stores and online at The Home Depot. Image via The Home Depot. Smoke detectors are the final piece of the home office safety puzzle. If having your important documents fall into the wrong hands is the worst thing that could happen, then having them go up in flames is the runner-up. Today’s smart smoke and carbon monoxide detectors, like those available from Nest, tell you what and where the problem is, rather than just sounding obnoxious and brain-jarring screeches. Whether you’re home or not, keep tabs on your property with instant text and email notifications. What are your favorite devices for home security? Writing for The Home Depot, Sarah Kellner provides Home Automation advice to homeowners, plus info on the latest smart home technology that can help monitor and keep your valuables safe. To find out more on smart home products, please visit The Home Depot home automation pages. When your office is located inside your home, it's up to you to keep it safe and secure; it is your livelihood, after all. Learn how to use home automation to safeguard your home office with a simple swipe on your smartphone or tablet. However, what about this? suppose you were to write a awesome title? I mean, I don’t want to tell you how to run your blog, however what if you added a post title that makes people desire more? I mean 5 Ways to Secure Your Home Office with Home Automation : PowerHomeBiz.com is kinda plain. You could peek at Yahoo’s home page and watch how they write post titles to grab viewers interested. You might add a video or a pic or two to get readers excited about what you’ve written. In my opinion, it could make your blog a little livelier.